Stopped at the lights at the top of the freeway exit ramp today I observed a lone figure resting against a light pole. Nothing unusual about this at all. After all, it was mid afternoon in the suburbs. Movement drew my eye back to this figure. He had reached inside his jacket and had pulled something out. Was he about to throw something over the bridge at the oncoming traffic? Something brown – he looked around and raised his arm to his face….and swigged, placing the bottle back inside his jacket, concealing it again. Then he leant over the bridge railing and seemed to be intent on the traffic. My stomach leapt and an internal dialogue began. The options were for me to personally intervene by leaving the car and going up to him, phone 000 or take a short detour into the local police station which was very close by or to do nothing at all. She took my name and phone number and the details of his location and dashed out. A police car was on its way before I could get into my own car and I went on my way. I don’t know whether I was right or wrong, I haven’t had any feedback and hope that the guy is OK. So from my point of view, & it’s my value judgement; standing on a bridge over a freeway on a busy main road and drinking mid-afternoon from a bottle in a brown paper bag indicates that there is a problem that needs to be sorted. I hope the cops were able to help him out. The challenge was to go 12 months with NO alcohol. $500 payable to charity if I had any! None of the February challenges or the dry July events…. 12 whole months. It was really difficult at first, with each day taken one at a time. 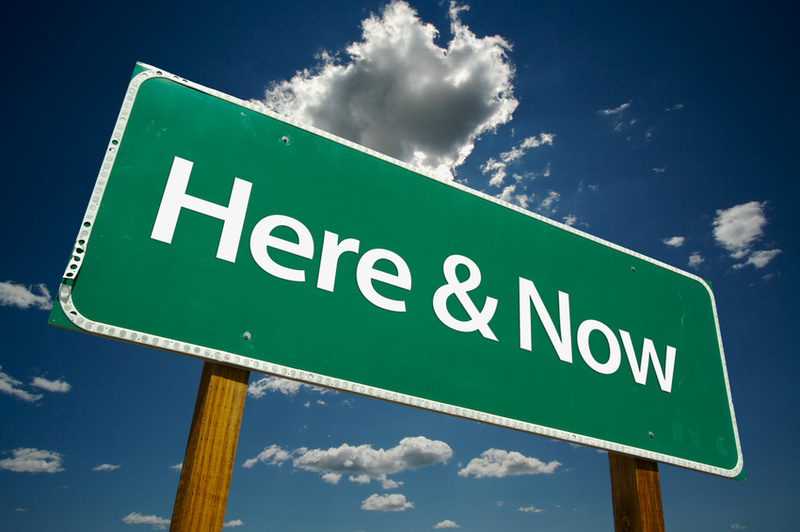 I had the mindset was that it was an unhelpful habit and habits can be relearned/unlearned. I also had a lot of support from a couple of people. The old habit was a glass (or two, sometimes more) on returning home from work to tune out from the emotional stress of being at school. When the work environment went “pear – shaped”, my Dad had a heart attack, my back went and I couldn’t get up off the floor – all in all the stress levels went through the roof to put it bluntly – a crisis was reached and enough was enough.This was breaking point. Time to walk away from both (school and alcohol) for a while and redefine my life. I had a realization that I was standing on the edge of a precipice and it was my choice to go down or change direction. Mending the mind from the school experience took a little while. I talked to a number of health professionals and rather than being supportive they were less than helpful. 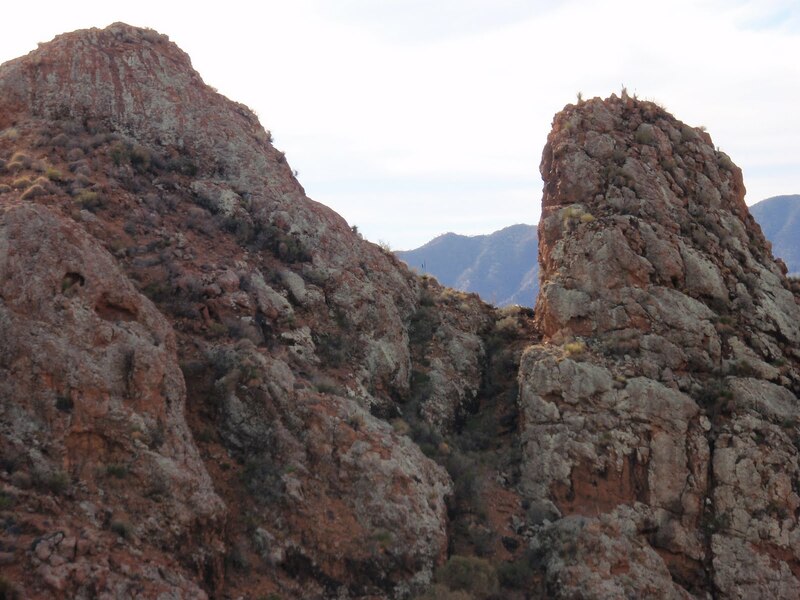 I may be wrong, but they were probably also standing at the edge of their own precipice too. My Hypnotherapy lecturer and my primary health carer – my Naturopath. Without the support of my talented and caring Naturopath in particular, I reckon I couldn’t have done it. Litres of soda water. Sometimes with a splash of Bitters, sometimes with a squeeze of fresh lemon juice. At least I was hydrated! I started counting and days were ticked off in the diary. Homeopathic remedies taken when the palate started craving and some Thought Field Therapy around the original cause and I reckon some quality TLC from a couple of special people. You know who you are! Friends seemed mildly curious and I became very aware that everyone seems to drink a lot. It is the Australian way of life!!! Social and family occasions are marked by copious quantities of booze. Family seemed bemused, then curious as to what day I was up to. This went on for several months and around the 6 month mark, I realized I was no longer recording days. I continued with my studies and found that I had more time to read, funny about that! Books about Choice Theory, NLP, and even some fiction. My priorities changed, I became more focussed and made some achievable goals and did some serious planning for the future. 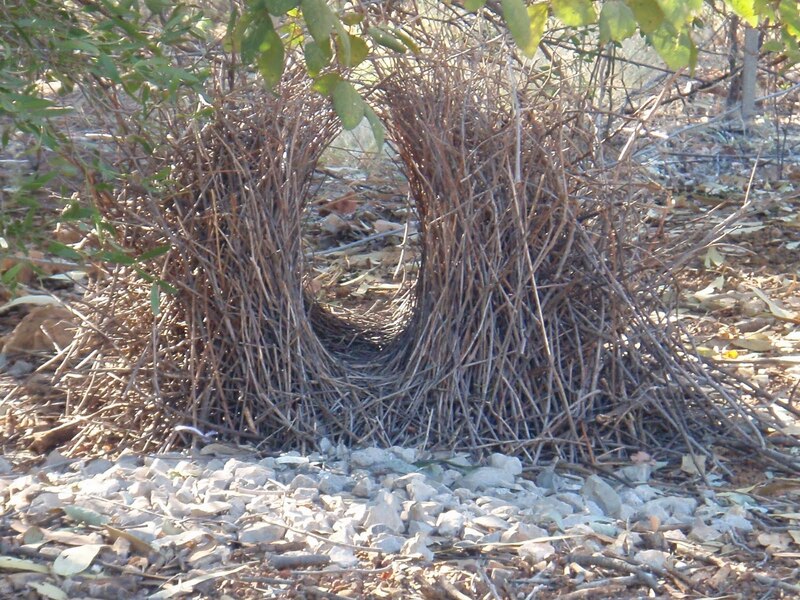 Travelling was interesting – particularly observing others’ routines. Set up, chairs out, pour a drink. So in many areas, while there are indigenous communities choosing to change their lifestyle and become dry, the grey nomads and other travellers are looking at the scenery from the bottom of their beer or chardonnay glasses. Easy to become self righteous about being teetotal, but I found that I had little to say to so many people now that alcohol wasn’t the social lubricant. Soda water was the main alternative, having found lemonade disgustingly sweet & don’t get me started on artificial sweeteners……..! A couple of times I bought some de-alcohlised wine, but it was so revolting that it wasn’t worth drinking. The only disappointment for the whole process is that I didn’t lose the weight I expected. Another alternative beverage became a variety of Chai teas, drunk black and without sugar. The T2 blends are nicest. A couple of times there were situations, that in the past a “stiff drink” would have been a help, such as when I got really sick after a “retreat” earlier this year (how I craved a ‘medicinal brandy then!) 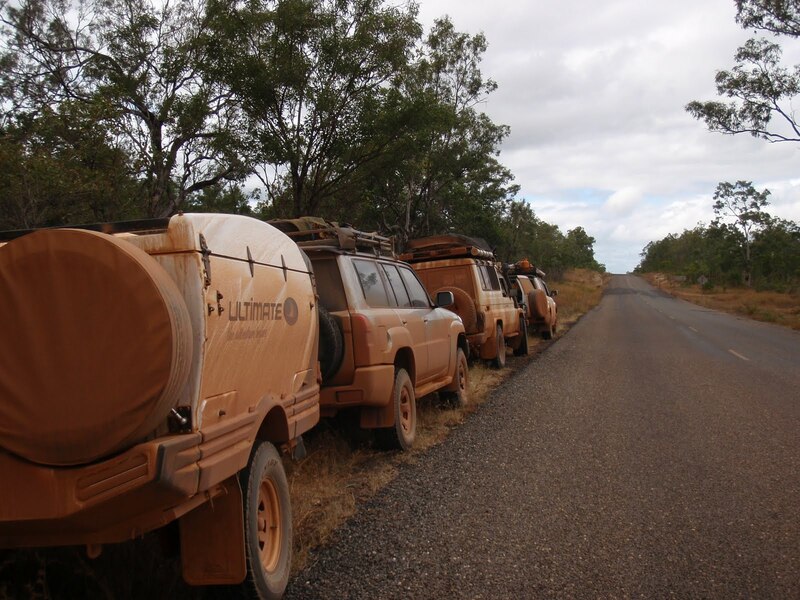 and getting to Innaminka after being stuck in the mud. Creating a sustainable future with better choices is my new mantra. Being a typical type A personality, I am driven to to this well. Of course I could do the alternative well too……..! Part of the personality trait is that I am attracted to “bright shiny things” and there’s something big glittering in my future! My 12 months with no alcohol. Will I go back to it? Probably not. I have plans for something big………stay posted! Details of the big trip as written in emails (with some editing and additions) to family & friends as we headed north to Cape York and then south west to Lawn Hill and on to Birdsville and Innaminka before returning home. 4 weeks, just over 10,000km. 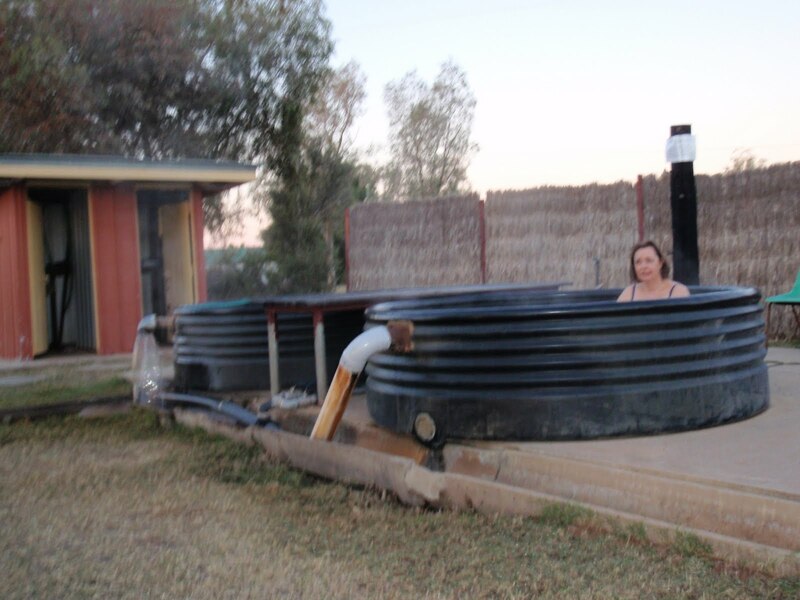 Day 2: up to Nardoo Station just 60km out of Cunnamulla, where they have 2 tanks with hot artesian water to soak in. Too chilly at night to do it, but OK in the morning. Day 3 : Nardoo to Muttaburra and here we had a problem with one of the gas struts on the gull wing door of the Ultimate letting go and causing the rivets on the hinges to pull completely out of the fiberglass. We had some Telstra coverage, so I emailed Ultimate for help. (only problem was that the next day and half was out of coverage!) 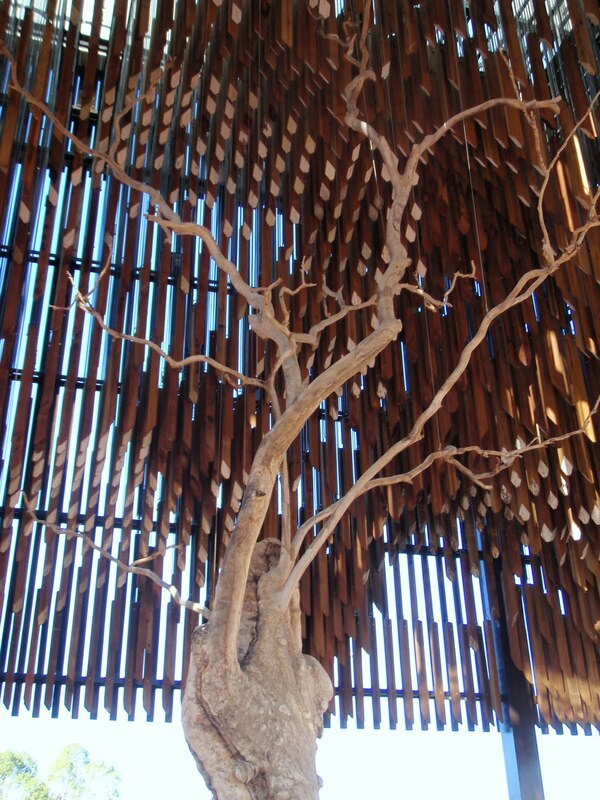 This day (funny how you forget which day it is when travelling) we stopped to look at the tree in Barcaldine where the union movement was born. It died in 2006 and there is a large construction around it. Art stuff. Next day (21st June)– Muttaburra to Undarra. The hotel where we stayed in Hughenden is closed and up for sale. Not surprising. We had a reasonably uneventful trip until we spied a helicopter circling the road ahead and lots of dust. 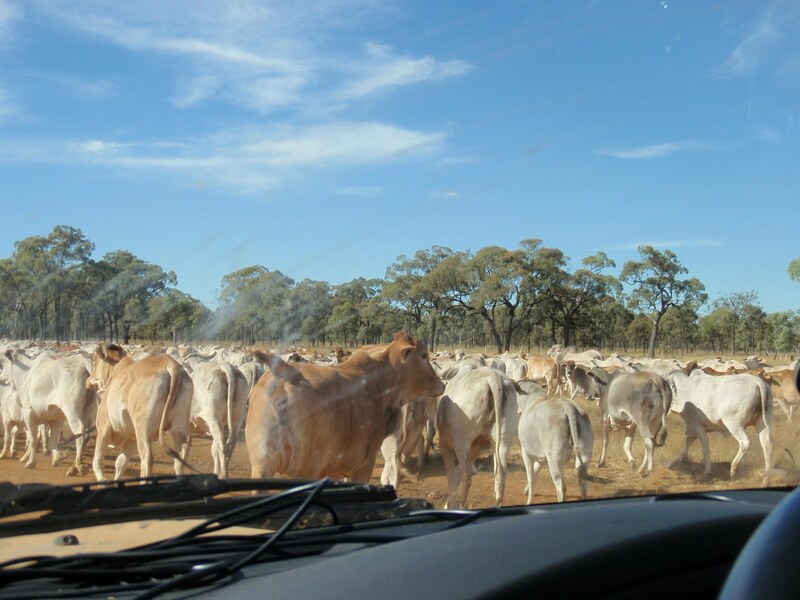 Next thing we knew, we were in the middle of a really big cattle muster – cows to the left, cows to the right and sometimes we moved faster than them, other times they moved quicker than us. 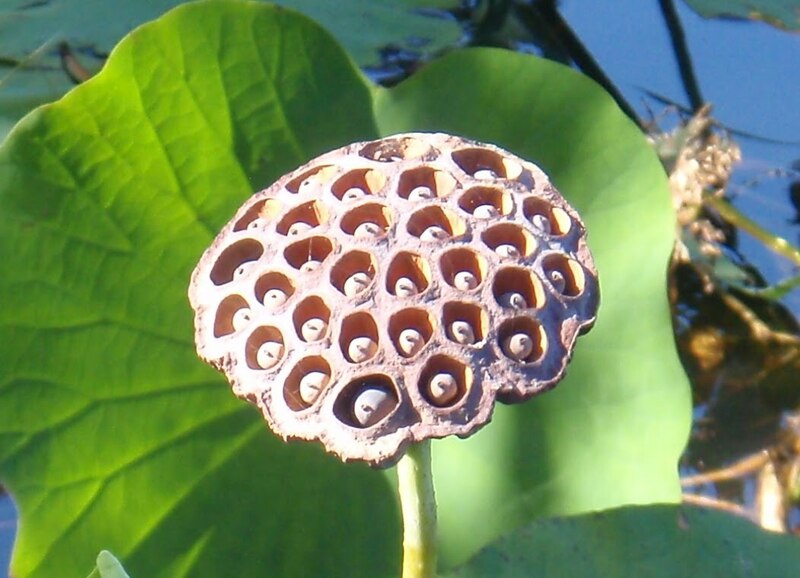 Must have been a couple of thousand of them. Anyway that slowed us down a bit. We didn’t book the tour and left about 8.30. We had morning tea up near Atherton and spoke to Ultimate who advised us either to get some araldite or see a boat builder. We found a boat builder in Cairns who was very helpful and he drilled out the rivets and put screws into the holes, with retaining nuts underneath. We will have to get it all fibreglassed again when we get home. We are staying at the same caravan park as we have before in Cairns and will probably push off tomorrow morning as the locals/permanent residents are a little odd. Phone coverage is pretty patchy, the iphone will read no service even if Michael has full bars- guess I should have stayed with Telstra! We drove through some thick fog this morning in the Atherton Tablelands and the weather here in Cairns is cool, very windy and overcast – probably will rain, but no surprise as we are camping with the Ultimate and it always seems to rain when we do this….. Arrived in Cooktown a little while ago and have set up in what was the Tropical Breeze now a Big 4 caravan park and quite pricey – but nicer than last night. Our neighbours are from Glen Waverley in a Kimberley camper. Been playing tag with 2 other groups of cars all day and one stayed at the Lion’s Den and the other group have just arrived here. 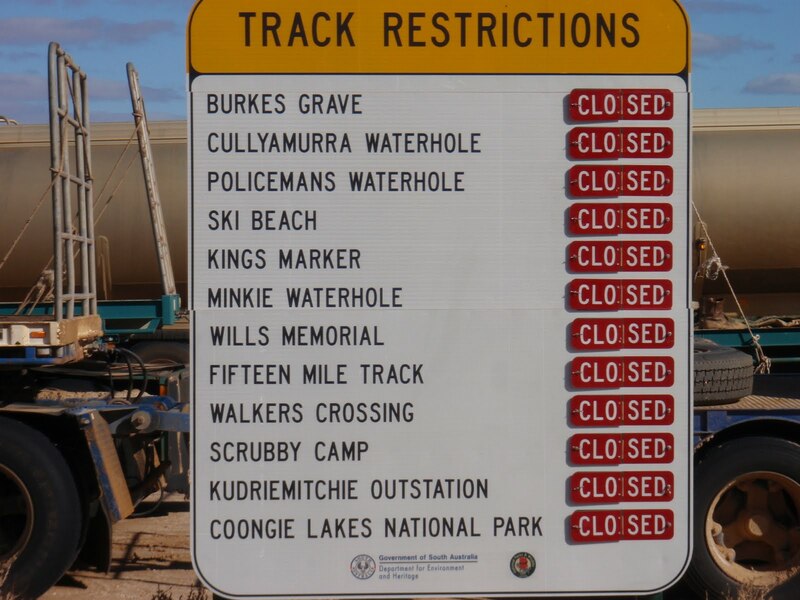 We heard some others planning to do the CREB track, but I looked it up on the internet and it was closed. We think we saw where it came out and there was a big double gate across it. The road conditions describe it as very difficult if there has been any rain and there was quite a bit over the last day. It rained a bit last night – apparently the Daintree got 8 hours solid of rain. Some of the coast road is made and the road outside the pub is bitumen. They were concreting a section today and it looked hard and hot work. Very narrow to get past and glad that we didn’t get any of the re-enforcing steel throught the sidewalls. The part where there were two concrete tracks like a driveway have gone. It’s blowing a gale here and will rain again at some stage. I had planned on cooking a boned roast on the BBQ for Michael’s birthday, but Michael is keen on the idea of eating in town and we are unable to light fires in the caravan park anyway. We will have the oysters I bought from the fisho who came around the caravan park a few minutes ago. We will head north tomorrow to see if we can get away from the wind and plan on getting to Kalpower in Lakefield National Park and camp on the banks of the river. We managed to book a site and got there in the late afternoon in time to see a large goanna digging a hole in the campsite opposite. This kept me busy filming for some time and when it ambled off, I went to look at what it had done. The hole was a good 6 inches deep and no evidence of what it had been after. I started to wander down to the crossing to take some photos when the rangers arrived, suggesting that I was already too close to the water and should go back. They had been called as some other campers had been washing their car in the crossing and others were swimming in the rockholes further down. Apparently there is a large resident croc there and all were very lucky to walk away unscathed. Very windy, and strong wind warning is still current from TI to Cairns – don’t think we will go out to TI – bit rough!! Anyway, been there, done that. Roads up here have all been upgraded. There is bitumen into and past Coen and then again from Moreton Junction. A single lane concrete bridge over the Wenlock allows the Brits Campers to proceed north. A very few sections of road have corrugations but they are bearable. Archer River had some water in it, but none over the causeway. The burgers were still good & we had an Archer burger for tea the night we stayed there. Apparently there were 300 there on Monday night and Twin Falls was full each night we were there. We met some other Ultimate people from Hastings at Kalpower crossing. Just a bit further on is a property called Pandanus, where Vietnam vets and other ex-military people can go and relax. Apparently they have even bigger crocs than Kalpower! 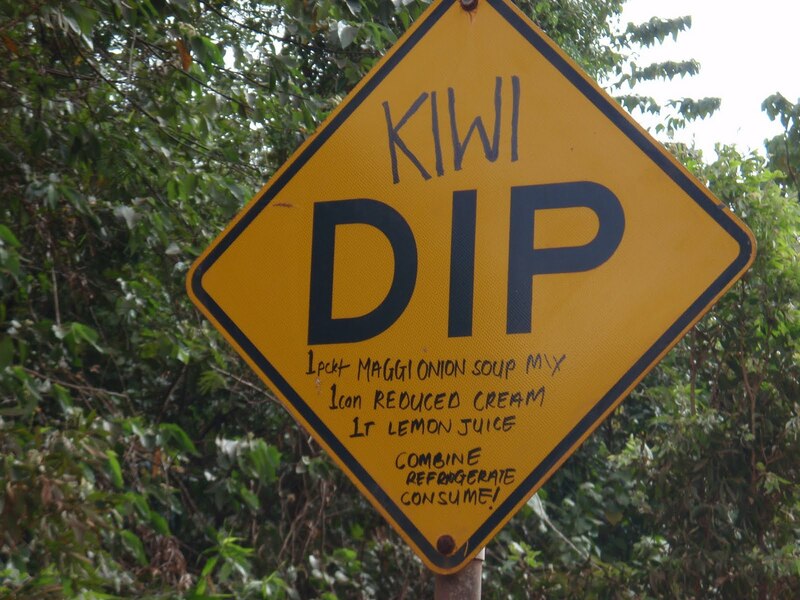 Most of the Dip signs that kept us entertained on our previous trip have been replaced although there are a couple that have the funny additions. Some not. We had a look at the southern Telegraph Track and decided that we wouldn’t do Palm Creek. Very muddy on the northern side and the first guy we saw got stuck on the exit. Other guys came through and got through OK, but a car and trailer had to be pulled up – he ended up doing his diff lock and the last we saw of them was at Twin Falls. We came back to the Telegraph Track via the Southern bypass and went down 2 crossings to Delhunty River and camped on the northern side which was much less crowded, we were the only people for a while – some ex Army guys rolled up and we have been catching up with them on and off since. They went on to do Gunshot, down the chicken track, which was black mud and wound down the side of the creek. Too sharp to take the trailer around and the other tracks down were vertical. One of them had a Troopie which had a little rest on the passenger side (not the whole way over) on the way into Gunshot. We met up with them again at Twin Falls and they saved us a good spot. One of them, Hughie is about 5’ and doesn’t eat much, just has lots of beer! Funny guys though! Twin Falls was great, although walking down to Elliot Falls and the Saucepan was very whiffy – there was a huge colony of fruit bats and the picnic area was totally unusable. There is now a board walk down to the falls as well. In the evenings, great swarms of bats flew off south – maybe to Fruit Bat falls – although there were none to be seen there during the day. We had a couple of swims each day and the first day we were there was a bit of rain, but still warm. We went out to Fruit Bat falls and they are really pretty. 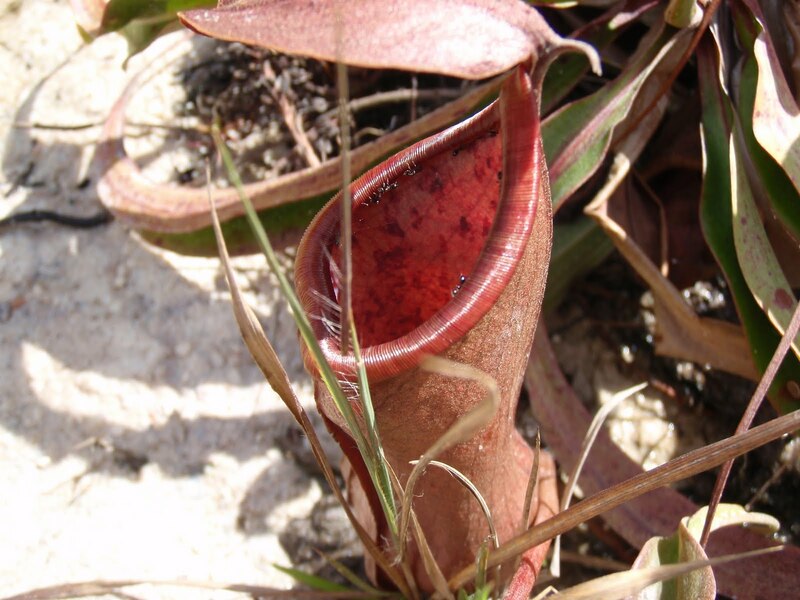 Pitcher plants growing on the banks along with other carnivorous plants and ferns. We sat in a pool there for a while & caught a bit of sun – glowing for the next couple of nights!! The first night at Twin Falls, 3 South Africans from Cairns shared our site as Twin Falls got really full. They were OK (couple of teachers, say no more!) & moved on to head north. We met them again today at the Jardine Ferry heading back south. The next night a trailer pulled in really late while we were socializing with the army guys, getting back to our site to find that a couple and their little girl had set up in our site. Our draw bar was in the way of their shade cloth flooring, that’s how close they were to us. 10pm and they were still having their domestic! It was then that we recognized them from Kalpower, & apparently they had been disturbing the campsite there with their arguments and been asked to move on by other campers and the ranger. Vrylia Point was interesting and we went via the northern section of the OTT from Twin Falls and then the main road. There is a log bridge on the way in and one big log is missing, so important to line up correctly to get over. We ended up at the southern section of the point. Heaps of debris on the beach from what is tossed overboard. Eventually we found the right spot and Michael drove along the beach to an old shipwreck, apparently used to be a lighthouse ship and then we turned back. He enjoyed it, I didn’t. We had lunch there and went back along the main road which was like a super highway except for a couple of kms of corrugations and some new sections of road. We had a leisurely pack up this morning, listening to the ongoing domestic of our neighbours and taking our time, which really only seemed to irritate them further, particularly as we had bacon and eggs and didn’t seem to be frantic like them. Part of their problem was that they had hired a camper (an Outback) and didn’t know how to put it up and down properly. We are staying at Loyalty Beach and have a nice, partial view of the ocean, but we can’t swim there because of the crocs. The army guys are here too, way down in the unpowered area and one of the guys saw a 5’ croc at his campsite last night. I’m sure there are a few around. 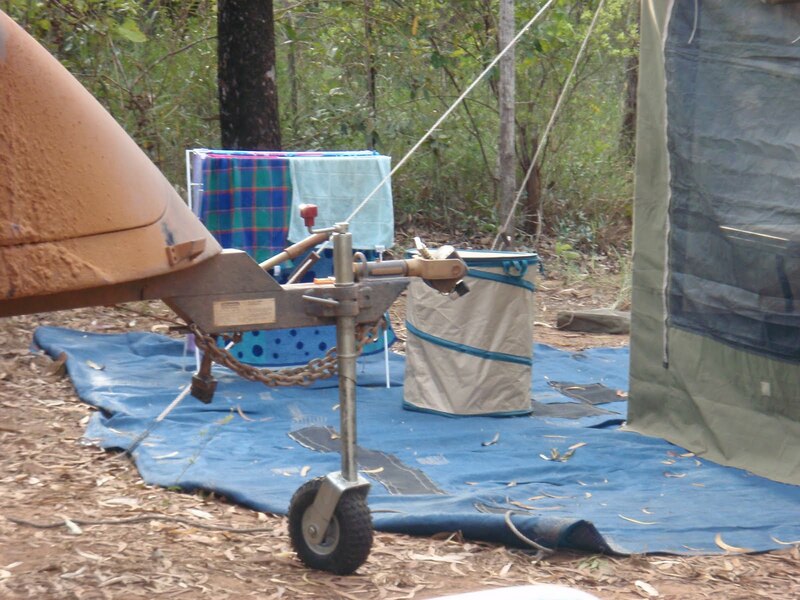 We have been into Bamaga and Seisa and had a bit of a look around. The wharf is totally fenced off now & apparently diesel is in short supply. A few places on the way up had already run out of unleaded. If it runs out we will just have to wait until more arrives. We had one jerry can left, which will do for getting around up here. Tomorrow we will head up to the Tip – according to one of the other travelers parking was at a premium up there, with little or no room to turn around. Our second day staying just out of Seisa, at Loyalty Beach in far northern Queensland and today we ventured up to the northern most tip of Australia. Earlier we spent some time exploring Somerset Beach and the old homestead site, before going down to look at a headland which at low tide allows one to travel along the beach for some distance. The tide was not far out enough for us to do this safely so we had to be content with driving along the sandy tracks leading to this beach. 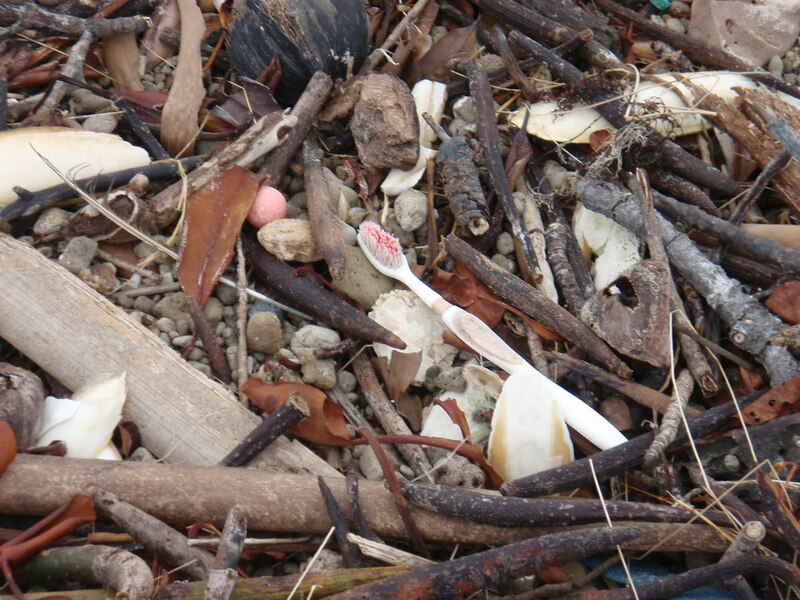 Again, lots of plastic rubbish – particularly thongs and drink bottles had washed up at the high tide mark. 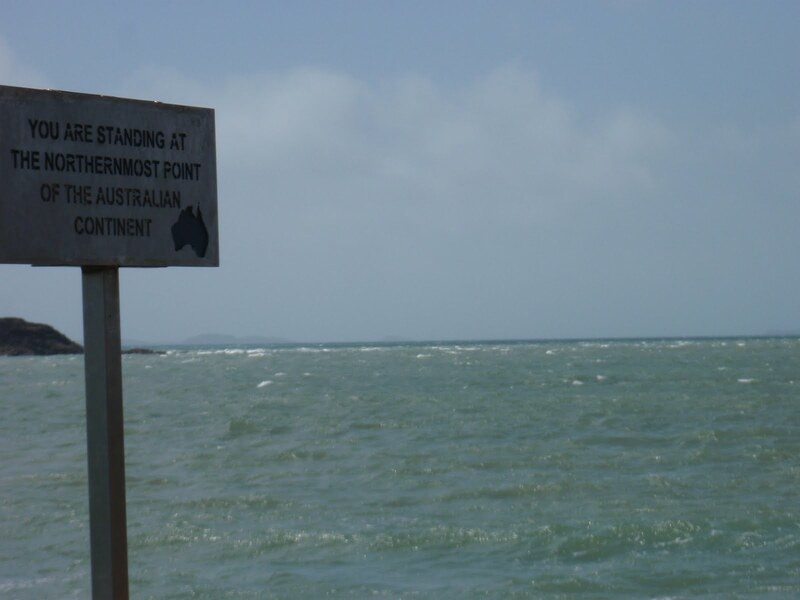 At the Tip, we parked on Frangipani beach and walked over the headland to reach the sign at the high water mark. After hopping around like mountain goats for a while, we took the ‘low road’ back via the beach and mangroves, keeping an eye out for crocs. There was an attempt up here to have a resort, but it was handed back to the traditional owners sometime before our last trip in 2000 and has remained unoccupied since. The rainforest is gradually reclaiming the buildings. It is all very spectacular. We revisited the old car park area where there used to be a boardwalk to the beach, but now no one bothers, with the gate to the old resort having been opened, people just drive up as far as possible. Sighted a Navy patrol boat today and apparently they visited the Tip yesterday in 3 inflatable craft, with a couple of their party leaping out to take photos and then returning to ship!! Sounds like fun! We possibly leave tomorrow to travel south, but are on “island time”, being closer to Thursday Island and PNG than to any major Australian city and plans may change. Nice to be able to have showers, although the 3 days spent at Eliot Falls/Twin Falls was really relaxing and we spent a bit of time in the waterholes, (croc free) and we may revisit them on the way back down. Having heard about the temperatures in Vic and NSW you can understand the reluctance to head south when we are sitting about in shorts and singlets. 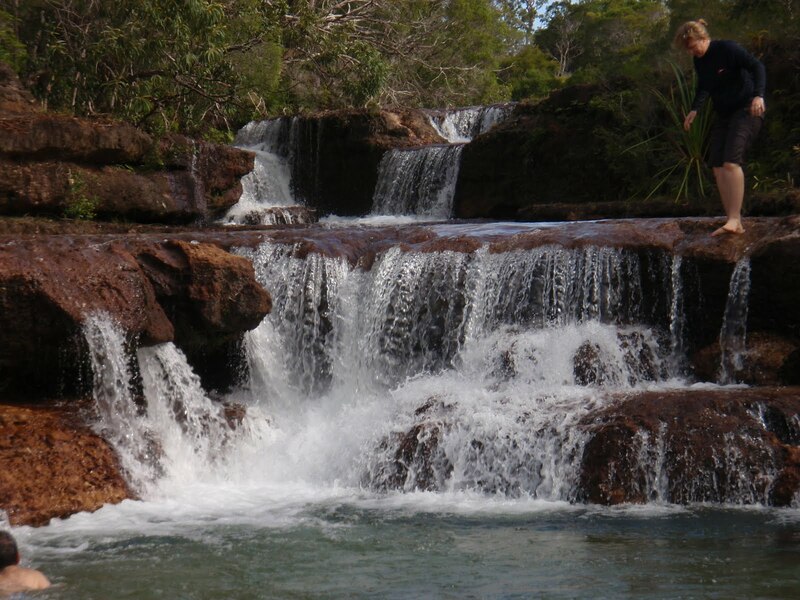 After a restful time at Loyalty Beach and exploring the tip of Cape York, we returned to Twin Falls for another visit. 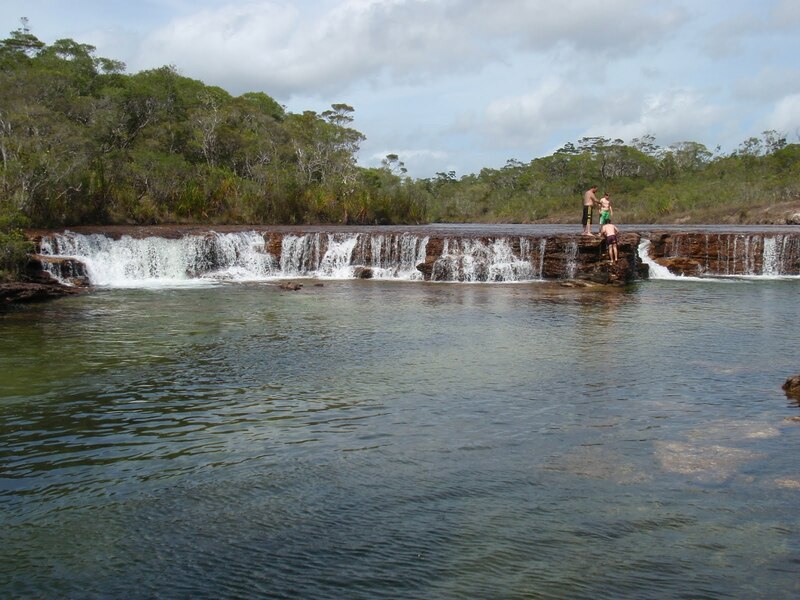 The waterfalls and pools were as delightful as before, and this time without the stress of the couple who were having domestics at every campsite! Light rain overnight and we packed up between showers. We detoured in to Captain Billys Landing and were advised by someone at the start of the road that the wind overnight had been gusting at 45 knots. It wasn’t so bad when we got in there and we had time for some fruit and water and moved on. This was where Michael and the boys went up the beach in 1999 on their motorbikes – lots of signs saying not to drive on the beach now. The car now has dirt sprayed up over the back passenger windows, indicative of some serious wet dirt road driving and the Ultimate is now a red/brown instead of white. Bit of a talking point on our arrival at various places and contrasts with the shiny white caravans that are everywhere. About 145km out of Laura, we discovered Ray and Les on the side of the road with another flat….about their 17th for the trip. Their spare was wrecked as was the tyre that had gone flat, so we lent them one of our spares and drove in to Laura with them, where Les bought 2 new tyres and we left them there. We headed off by 9am and went to Croydon and got there just on dusk. Fairly uneventful day, although we did stop to look at an interesting chimney and croc free lagoon (mandatory photos taken). 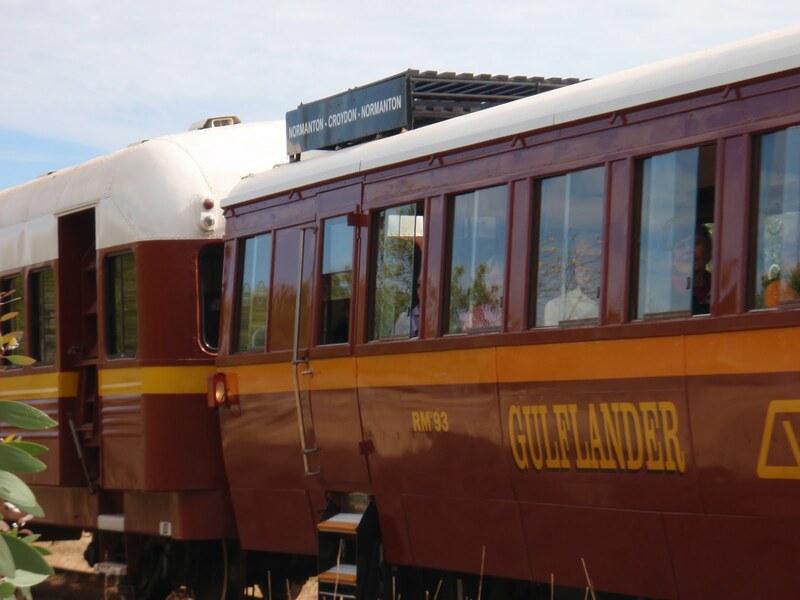 Next morning, after another hearty breakfast of bacon & eggs and a leisurely pack up, we headed off to Normanton, stopping in time along the way to see the rickety old Gulf Lander train (and take photos & video) pass by. 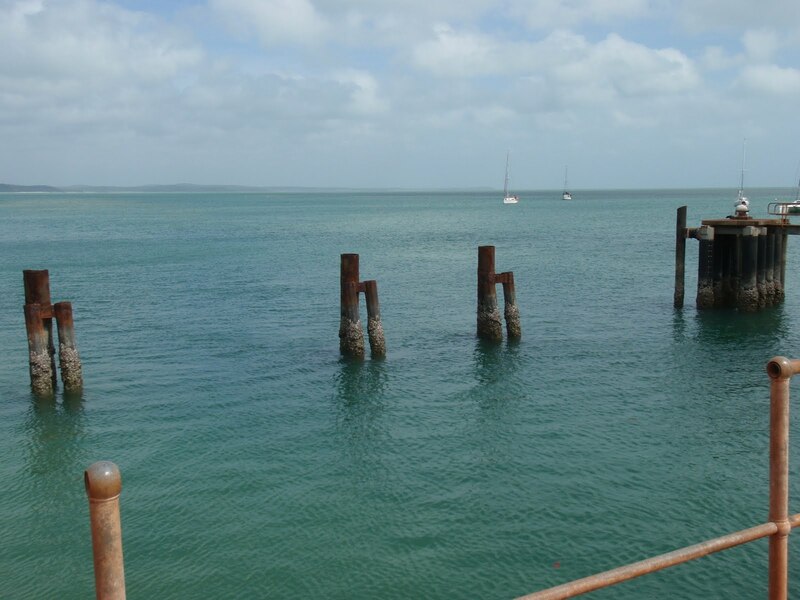 Into Normanton, visited the bakery and headed up to Karumba on the Gulf to have our lunch. Interesting landscape and a pleasant 30C although the wind was still a bit blustery. There has been a strong wind warning from Thursday Island to Cooktown the whole time we were up there. From the Falls we headed down to Lawn Hill where we stayed for 2 nights at Adels Grove amongst the bamboo and trees. Lots of smoky fires, hot showers and more Victorians on the run from the cold. We went for a 2 hour paddle up the Lawn Hill Gorge in the morning and soaked in the awesome scenery. Bit weary on return, so we had an afternoon reading our books and lots of Tiger Balm on the biceps at bedtime! 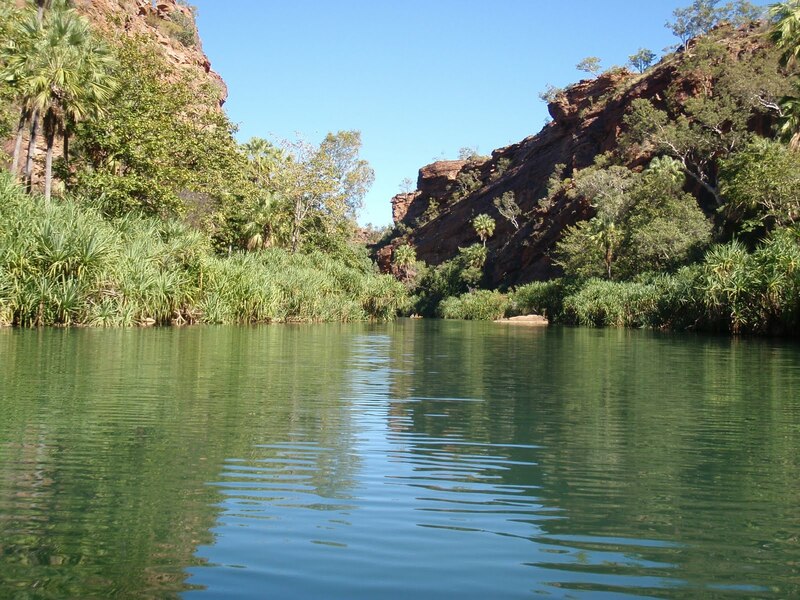 From Lawn Hill, we detoured via Riversleigh which is a world heritage area – saw a couple of real fossils and headed off again arriving in Mt Isa mid Saturday afternoon to find it booked out. We replenished some supplies and headed south to Boulia, but got as far as a little place called Dajarra about 145km short, where we camped with others in the ruins of the railway yards. It used to be a major cattle rail head until the advent of road trains. The road is a narrow strip of bitumen with evidence of the recent rains on the verge. 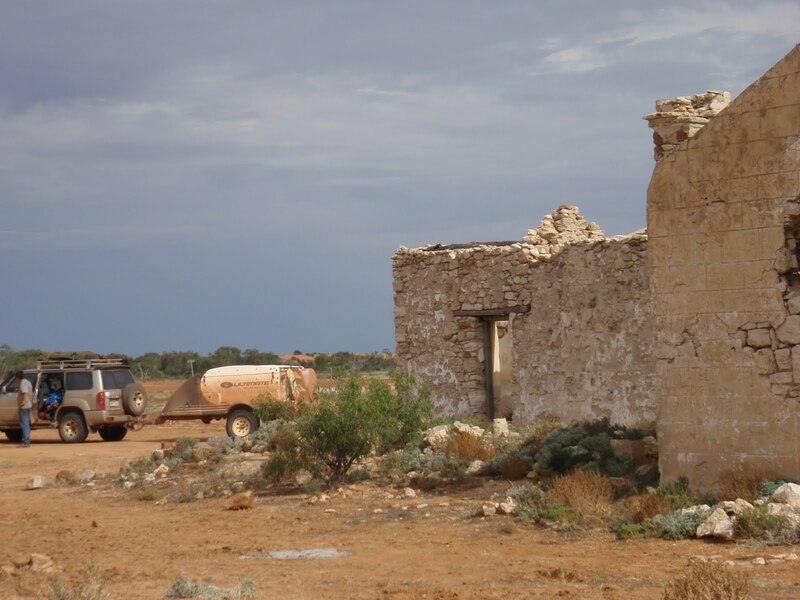 The local Police station has the remnants of a caravan that flipped on the soft verge last Thursday, and the roads have only just been re-opened to Birdsville. 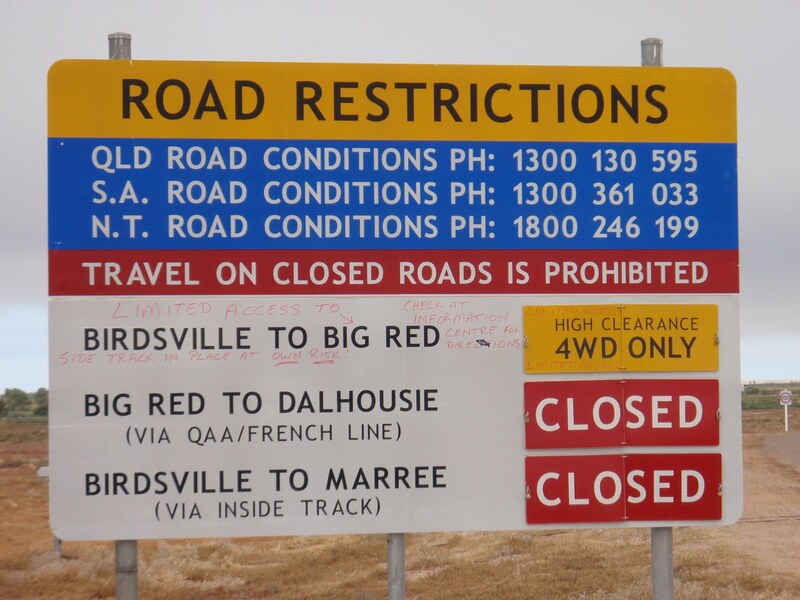 Diamantina Lakes NP is still closed, so we won’t be able to get in there this time. More rain is forecast for Monday and Tuesday, but we should be far enough south by then, if not, we may just be stuck wherever for the duration. Nearly home, well relatively speaking, with about 800km to go. 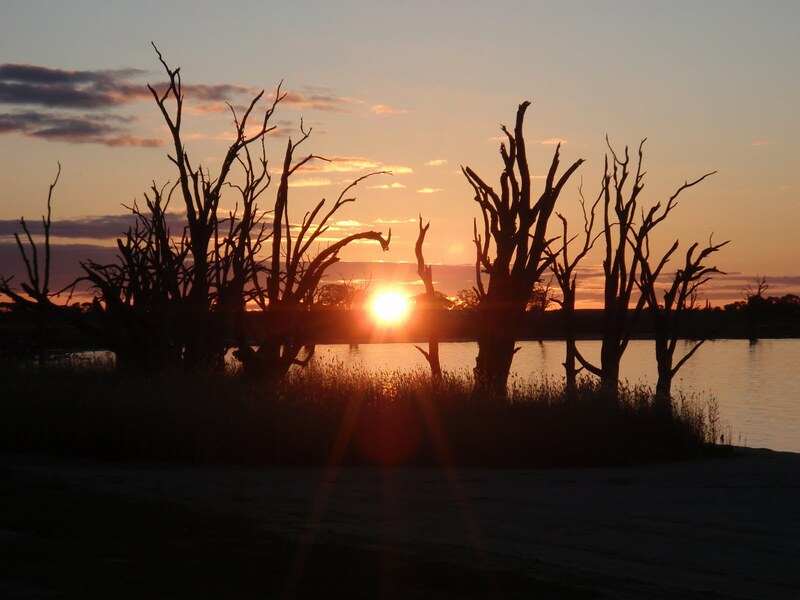 We stopped at a tiny place called Barmerah on the edge of Lake Bonney in SA. Getting acclimatized to the cold by sitting in a canvas contraption before returning to Melbourne. After a quick tour of the town & sampling its culinary offerings, it is obvious why the main road bypasses it. 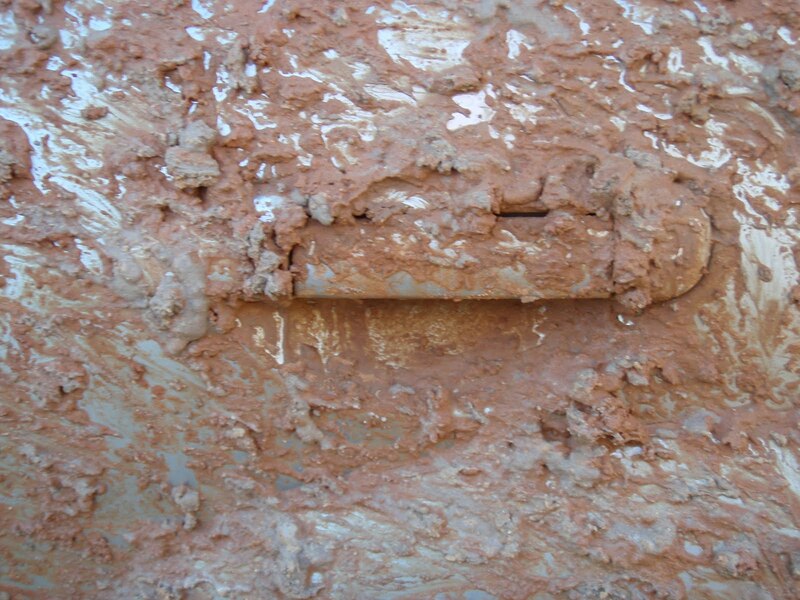 Since the last update there has been great rushes of adrenalin…..
We arrived in Birdsville safely and set up in the caravan park and enjoyed the hot showers and treated ourselves to washing the clothes in a machine – makes all the difference to getting the red dirt out! Sunday dinner at the pub and it was a tasty roast. Being a vegetarian when travelling in the outback has gone on hold as choices for food are somewhat limited. We decided to stay a second night and relaxed by going out to play on Big Red on Monday. 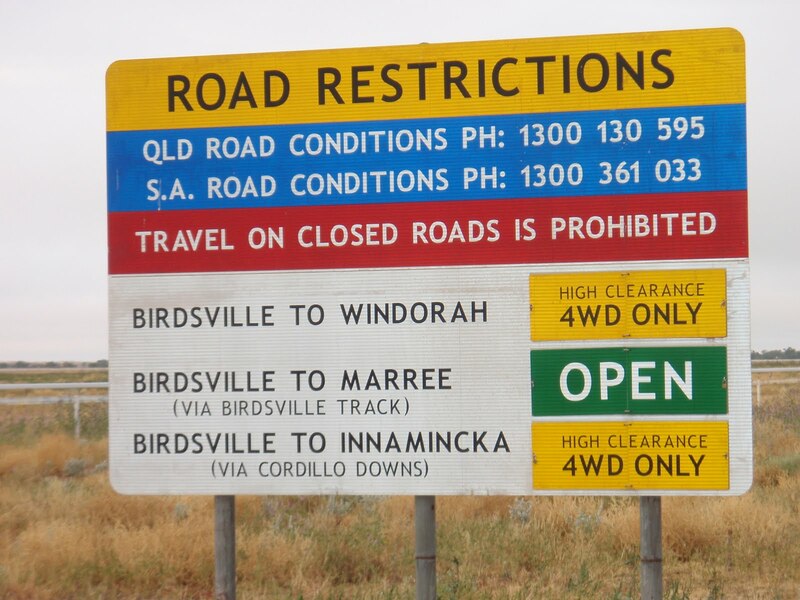 A 10km diversion was in place on the Eastern side (Birdsville side) and a profusion of wildflowers and birdlife. Lots of flower pictures! We went west over little Red and then around the Western diversion to go up Big Red – 2 useable tracks to play on this year. We did the one to the right, straight up and then watched some others play as well. Michael went down the steeper one and then attempted to come back up again a couple of times, dropping tyre pressure each time until he got to 13psi…… but to no avail. Back to town and more bird, flower and water over road photos and to plan the next stage home. Tuesday morning and a smell of rain in the air which developed into a light drizzle as we bought fresh rolls from the bakery. I ducked into the information centre to find out the road reports and the guy in there said that everything was open, but with 3 states and all the different shires the latest reports were difficult to get. 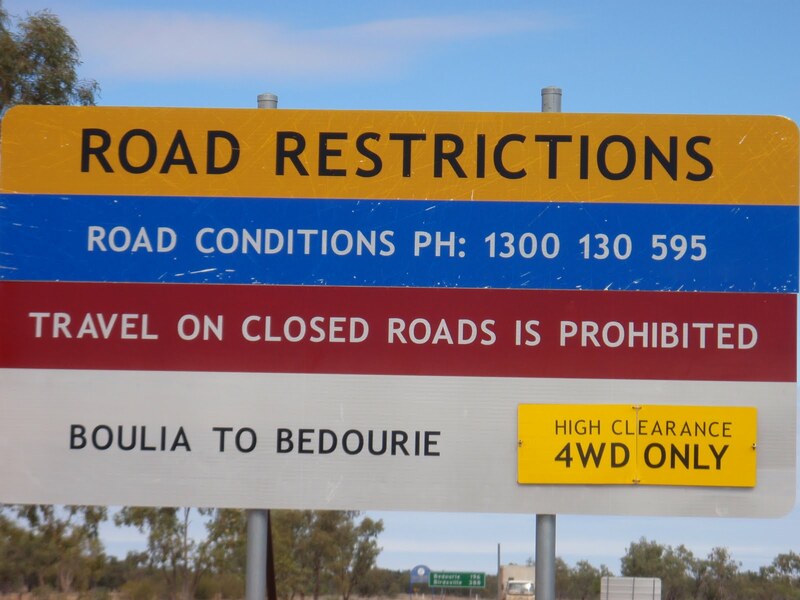 We set off along the Birdsville/Windourah road in bright sunlight (having taken photos of road signs advising that the roads were open). Many of the swales were full of water and looked spectactular. We decided to head south to Innaminka and from the high ground the lakes to both sides of the road were testament to the heavy rains that occurred back in February. The road was good to the border and we re-visited Cadelga ruins where an old car remains behind the ruined house, rusting away and full of bullet holes. Took some more photos of the ruins, but I think I must be running out of unusual/arty angles to try to make a ruin look creative! The sunlight helped. Past the largest sheep shearing shed at Cordillo Downs and onto the intersection of the Cordillo Downs road and the turnoff to Arrabury for lunch and a wood finding stop. (and more flower photos!) Still in sunshine….This information becomes important just a little later…..
About 20 minutes down the track and less than 100km to Innaminka, the rain started…… just a few drops then a gentle drizzle…..only problem was that the ruts in the dirt road were filling with water and it is a scary sight to see a puddle of water moving rapidly towards you down the road. Those of you who have experienced this will understand. Gradually the road became more and more slippery and there was soon evidence that the rain had been heavy in spots or it had been raining for some time as there were sections of the track completely under water and the bypass tracks also under water. Corners began to be a nightmare as we slid in all directions – a couple of times coming to rest on the low side of the road with the water rising rapidly in the streams running down the road. Some of the marked creek crossings had less water than the road and parts of the road were actually running along creek beds……at least it was still daylight…. Getting up and over the grids were tricky as the clay either side caused us to slip, but if we wanted to stop without sinking into the mud, the grid was the best place to be. The creeks were getting deeper and we were gauging the height by the road posts as often there was no flood indicator – I saw one in a creek that had been knocked flat by the grader, so not much help there. They were also starting to flow quite rapidly, so that was another hazard. We came to one just before dusk that was flowing quite fast and checked the road posts and could still see the reflectors, so figured it would be OK to try. The water got deeper and deeper – up over the headlights, over the bonnet and we both uttered the same word as it came up over the windscreen to about the height of the rego label….fortunately the car kept going and we got out the other side. Michael said later that he felt the Ultimate start to float…..we hadn’t counted on some of the posts being submerged in the dip of the creek…. But there’s more…..dusk fell and we were now doing all of this in the dark, some 30-40km to go and hoping that the causeway at Innaminka would be passable. Another slide and Michael thought that we would be stuck for the duration, but he managed to get us out again. Finally the Innaminka airstrip, then the causeway. Water was flowing fast, but not so deep as the earlier crossing, so we took a deep breath and went. We finally got onto the Common around 7pm (Tuesday) having taken around 5 hours to do less than 100km. 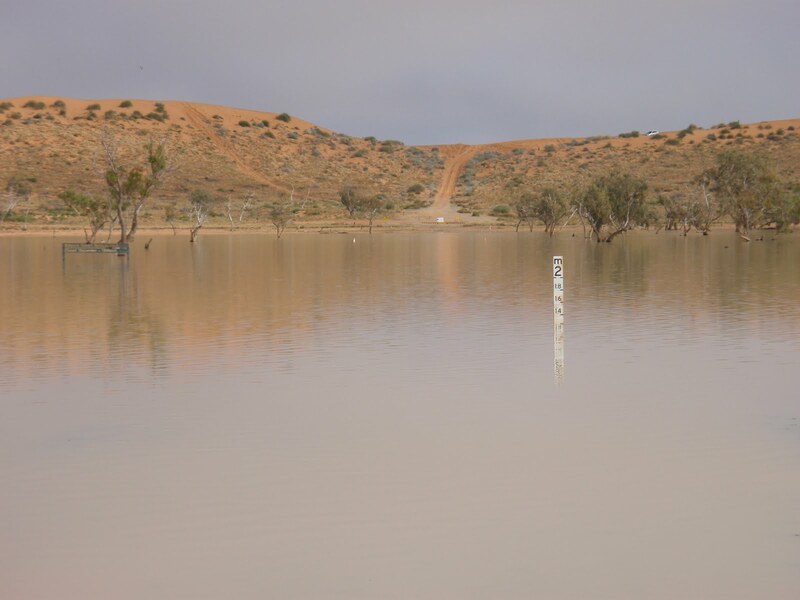 Flooding earlier in the year was substantial and the Nappa Merri bridge was about 8m under water and the causeway into Innaminka about 11m! Hence the reluctance to stay put and take chances on rising water. Later we found out that 45mm had fallen between 3am and 6pm. We stayed there until around 1pm on Friday when the road to Lyndhurst was re-opened, having decided that if any road opened, we would go in that direction. Rain was forecast again for Saturday/Sunday, so we took the opportunity and quickly packed up. 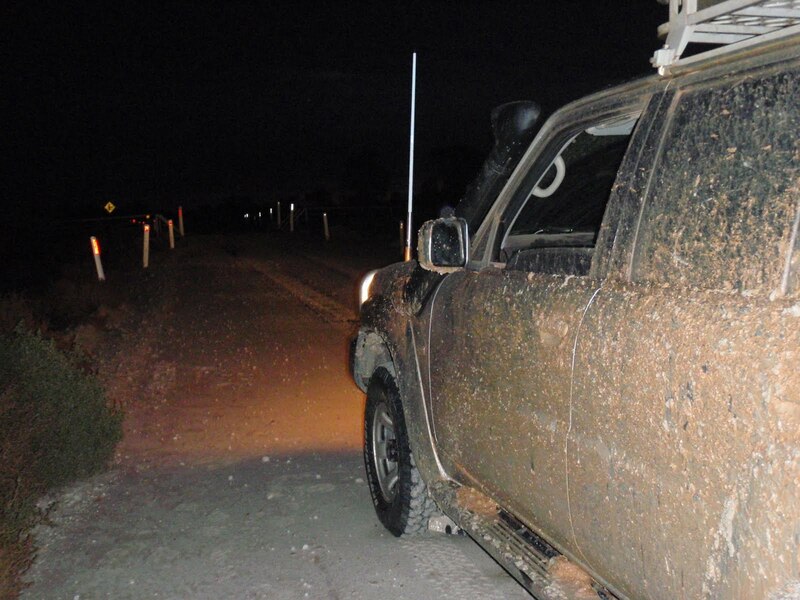 Others had left earlier, some taking their chances before the roads officially opened & one group was caught on Thursday when they got bogged and had to get pulled out. Word got around quickly about that one! 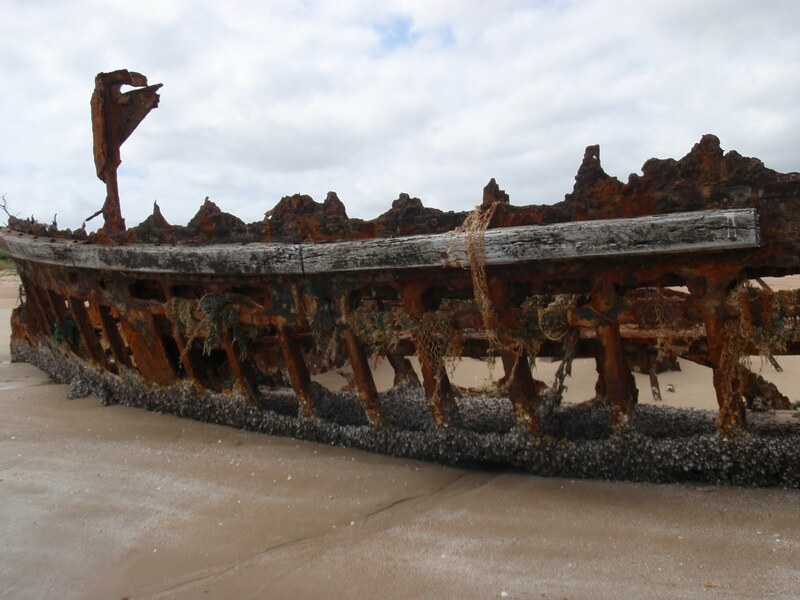 On return, we read a blog from some Californians that we had met in Birdsville, who also got delayed at Innaminka. They left before 5 one morning and one can assume that they didn’t know that the road south opened later on Friday. They didn’t mention dates! Parts of the Strezlecki Track now have bitumen on it, 7-8 km stretches every so often, but the main bitumen at Lyndhurst was delightful to reach. We headed on further to Copley and made that in time to get a site at the caravan park and dash to the Leigh Creek Hotel (at Copley) for a counter tea. Nice not to have to do the dishes! Hot showers in the morning and packed up to head home, through Peterborough and Orroroo. The Patrol has developed a bit of a worrying noise and is still coated in many layers of mud although we have attempted to keep the headlights and windows clean. Last overnight stop, pizza for tea – I reckon it will be another couple of years before I manage another pizza after this one…..
July 27th – we pick the Patrol up in the morning after its little holiday with the mechanic. It has a new windscreen (fitted before it went down there) and a new airconditioning unit – the bottom bearing went. And it had its 10,000km service… they mentioned something about a lot of dust in the air filter……!